As another new year approaches, people across America are resolving to lose weight, exercise more, manage stress and make other changes improve their health and life. 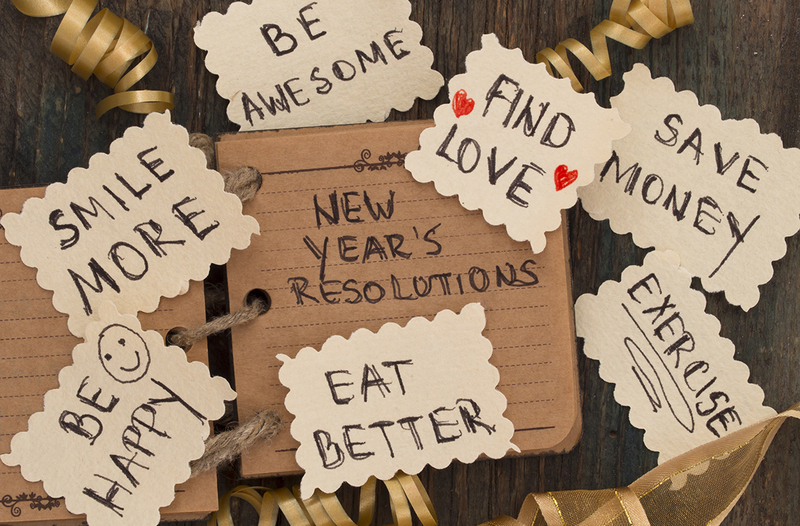 According to an article in the Journal of Clinical Psychology, 40 to 45 percent of American adults make resolutions—but just two weeks later, only 71 percent are still sticking to them. How do you make resolutions last? First, be realistic. When you set unrealistic goals, you set yourself up for failure. Choose goals that are achievable, and reasonable. Better yet, select just one goal instead of three or four. This helps you focus your efforts and maintain motivation. When you set too many goals and one falls apart, it can have a domino effect on the others. Don’t wait until New Year’s Eve to choose your goal. It takes attention, motivation and awareness to successfully change behavior. Whether you want to hit the gym, spend more time with family or meditate, start now to make a plan for how that will happen instead of waiting until the last minute. Schedule time for your goal—for example, decide that you will go to the gym during lunch or spend one night a week playing games with the kids. Knowing how you are going to achieve your goal makes it much easier to fully commit to it. Be gentle with your approach, not obsessed, and see yourself with kind eyes. Habits and behaviors don’t change overnight. If you miss a workout or do something else counter to your goal, don’t punish yourself or throw in the towel in self-disgust. Instead, deal constructively with setbacks. Think about how you might speak to a friend or an older child who had a setback. Most likely, you would be kind, positive and encouraging, rather than critical or negative. Speak to yourself the same way, and it will be easier to get back on track. Remember that changing habits is a process, not a one-time event, and stay focused on the big picture. And when you have been sticking to your goals, reward yourself. Positive reinforcement, such as allowing yourself to buy a new piece of workout gear or getting tickets to a show, bolsters your selfconfidence and your resolve. Take time every day to visualize yourself achieving your goal. This is known as “positive end-result imagery”; when you bring your attention to visualizing your goal every day, it begins to become subconscious and automatic. When your behavior no longer has to be filtered by the prefrontal cortex of the brain for logic and judgment, it becomes almost natural—something you do without really thinking about it. How do you do this? Take two minutes a day and breathe deeply while holding the image in your mind of you successfully accomplishing your objective, and smiling about it. After several weeks, the new behavior will become nearly automatic. Finally, think about what you are most grateful for in life. This helps your brain, your mood, your interpersonal skills and your motivation. In my new book, Code to Joy, we talk about the newest exciting neuroscience and what creates joy, and methods to accomplish that. Every day, perhaps in the shower or when you are doing some routine activity, think about what you are most grateful for in life. Even in this tough economy when many people are struggling, feeling grateful about something as ordinary as the warm water washing over you, or the sun shining outside, can have a positive effect. As you do this more often, you will find yourself adding more and more things to your list. When you regularly practice being grateful, you begin to strengthen the left prefrontal cortex, the part of the brain associated with happiness. This, in turn, helps you feel more empowered to reach your goals and create the life you want.